Some cafés are loud and proud, their illuminated signs and multicoloured décor hard to miss, whereas some are a little more subdued, opting for subtlety and exuding a certain air of finesse. Boschetto, located along the Princes Highway in Rockdale is the perfect example of the latter. Boschetto might be a little hard to spot, but it's definitely worth looking for. Strolling down the footpath you'd be forgiven for nearly missing the café. 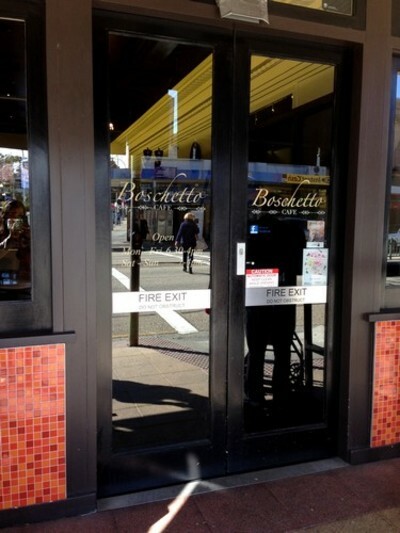 The narrow entrance, a simple black door, printed with the name Boschetto in small metallic font the only clue. There aren't even any outdoor tables crowding the walkway - usually a prime indication that a café is lurking nearby. Don't let the narrow doorway mislead you though, because inside, Boschetto is anything but dingy and dark. A fascinating mix of glamorous and industrial, Boschetto pairs glimmering oversized mirrors and soaring ceilings with restored crown moulding alongside enormous rusted antique tree felling saws - a look which baffles even the staff, and which admittedly shouldn't work, yet somehow does. 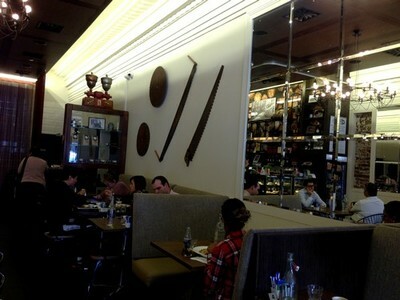 As far as the food goes - because really we're here to eat, not stare at rusty chainsaws - the menu at Boscetto is vast. Serving all day breakfast that includes so much more than your standard eggs and sausages, as well as a range of typical café staples for lunch. 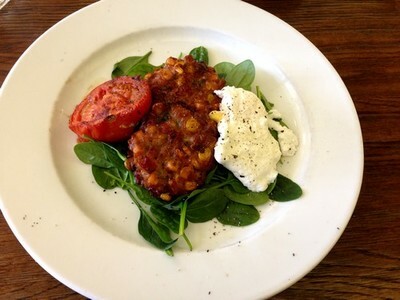 Sweet and juicy - the sweet corn fritters. First up, off the breakfast menu, corn fritters on a bed of spinach, topped with roasted tomato and a poached egg and drizzled with truffle oil ($13). While the fritters are light and fluffy, the corn delivering a sweet burst of flavour and the poached egg gooey and delicious, the plate overall seemed overly sweet and lacked balance. A spicy salsa with these sweet fritters wouldn’t go amiss. Fried to perfection and smothered in honey mustard mayo - the Alabama sandwich. For something a little more substantial, Boschetto serves up a selection of fresh burgers and sandwiches stuffed with a range of fillings. 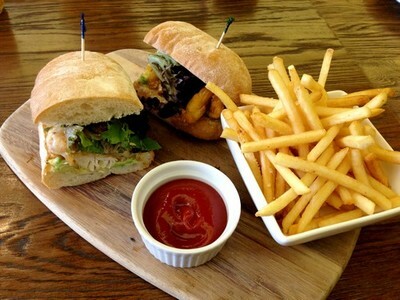 The Alabama sandwich ($12) takes a juicy battered and fried (it just wouldn’t be American if it wasn’t fried) chicken breast and serves it up in a lightly toasted ciabatta roll with fresh lettuce, buttery avocado, cheese and a sweet and tangy honey mustard sauce. If you’re having a hard time deciding on which tasty sandwich to go for, Boschetto offers up a pretty great solution – sliders. Mini versions of the most popular sandwiches (3 for $14) make up the perfect tasting plate. 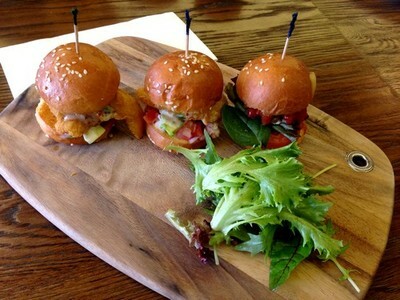 Sliders; perfect for those having a hard time deciding what to choose. Salads always get a bad rap for being dull and uninspiring, at Boschetto though the salads are anything but, and are certainly not just for those conscious of their physique. Grannies apple salad ($16); a heap of baby spinach topped with pearl couscous, slivered almonds, fresh Granny Smith apple and juicy orange segments and finished off with char grilled fennel and a tangy citrus dressing, is truly special. The char grilled fennel develops a unique, almost meaty flavour and the entire dish is a perfect harmony of flavours, with all the textural elements that make food exciting accounted for. So whether you're a fan of oversized tree felling equipment or simply a fan of good, honest food at a great price, Boschetto is definitely worth a visit. Where: 483 Princes Highway, Rockdale, 2216. Why: Good, honest food at great prices.